This lemon poppy seed scones recipe is casual enough for everyday breakfasts or afternoon snacks and fancy enough for a weekend brunch. Serve these light and flaky scones with jam or cream, coffee or tea. Frozen scones can be made ahead for easy entertaining and last 3 months or more if properly wrapped. Mix the flour, sugar, baking powder, baking soda and salt together in a large bowl or in the food processor. If you’re doing this by hand grate the frozen butter as you’d grate cheese. Then use a pastry cutter or fork to crumble the butter into the flour until it looks kinda like cornmeal. If you’re using your food processor cut the butter into about eight pieces so it combines faster. Next, add the sour cream, egg, extracts and poppy seeds. Pulse or stir to combine. I line my cookie sheet with parchment paper and then dump all the dough into the middle of the sheet. Flatten the dough until it’s about ¾ inch thick. Sprinkle the dough evenly with one tablespoon of sugar, or if your using glaze leave it plain until it’s done baking. I prefer triangles so I cut the dough like a pizza, first cut it in half, next into quarters and cut each quarter in half again. Spread out the scones so there is about an inch between the pieces. A thin, flat spatula helps you keep their shape while moving them. Bake for 15-17 minutes until slightly golden brown. Do not over bake or they will dry out. Cool for at least 5 minutes before serving and at least 15 minutes before glazing. Use cookie cutters to make other shapes. 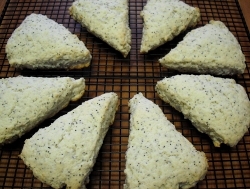 The base of this lemon poppy seed scones recipe can be used to add your favorite flavors. I love 1 tsp almond extract and ½ cup dried cranberries. Slowly substitute in up to half wheat flour for the white flour. Leave off the sugar or glaze from the top. Scones can be frozen before or after baking. When unbaked I still like to shape them first, that way I can just toss them in the oven. Place the raw, shaped scones on the cookie sheet into the freezer until solid, about an hour or two. 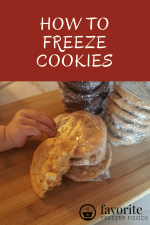 Then put the frozen scones into a freezer bag or wrap in plastic wrap and tinfoil. Baked scones can be bagged before freezing. If your freezing glazed scones wait for the glaze to dry so it doesn’t stick to the freezer bag. Label and date the bag then add the scones to your freezer inventory sheet. How To Thaw Frozen raw scones can be baked from frozen. Preheat the oven to 400 F then check the scones in 18 minutes, and every 2-3 minutes after that. They may take up to 25 minutes to bake. Take them out as soon as the bottom edges turn golden brown. Baked scones can be thawed in the fridge or at room temperature for a few hours or overnight. Unglazed scones can be warmed in the oven for a few minutes as well. 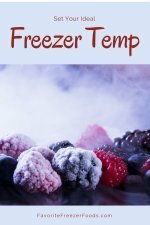 Learn more about freezing baked goods. 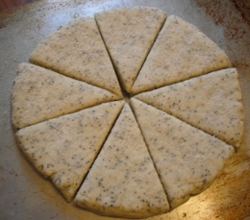 Return from Lemon Poppy Seed Scones Recipe to the homepage of Favorite Freezer Foods.